The Crème R-STRIA is our soothing body cream that alleviates existing red stretch marks and prevents the formation of further stretch mark scarring by decreasing inflammation and reconstructing the dermal fibres. R for “Rouge” (red) relates to the red colour of fresh, inflammatory scar tissue stretch marks; they first appear red then fade to white over time. When subjected to undue tension, dermal fibroblasts emit signals to the leucocytes (white blood cells) by synthesising pro-inflammatory messengers. The latter causes the release of enzymes, elastase or collagenase, responsible for the degradation of the extracellular matrix. The elastic fibres are stretched, thinned and dispersed through the dermis. It is this inflammatory reaction in the dermis that gives fresh stretch marks their purplish-red colour. The soothing properties of the polysaccharide rich in rhamnose, which attaches to the membrane receptors of the keratinocytes, alleviate skin inflammation prior to the formation of white stretch marks. In addition, black crowberry juice improves firmness and skin microcirculation. Lastly, thanks to the synergy of the active ingredients in the complex, Crème R-STRIA stimulates the synthesis of collagen and elastin fibres, which support the dermis while inhibiting the fibre-destroying proteolytic enzymes. The presence of serenoa serrulata (saw palmetto) oil extract enables optimal 3D dermal fibre organisation and therefore better healing. Also affected by white stretch marks? 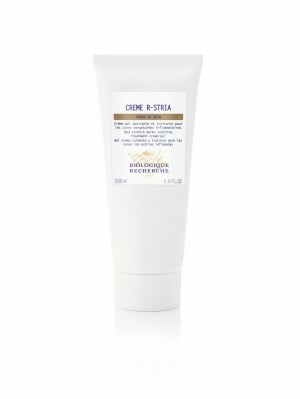 Discover our Crème B-STRIA. Inflammatory red stretch mark Skin Instants®. Collagen and elastin synthesis agents: Bean extract and biomimetic peptides. Reorganisation of the dermal fibres agents: Saw palmetto oil extract. Toning agents: Black crowberry juice. Soothing agents: Black crowberry juice and polysaccharide rich in rhamnose. Skin microcirculation agents: Arnica flower-based complex and Solomon’s seal.